Ansley Designs: 10 CHEAP & Easy Halloween DIYs to Try! 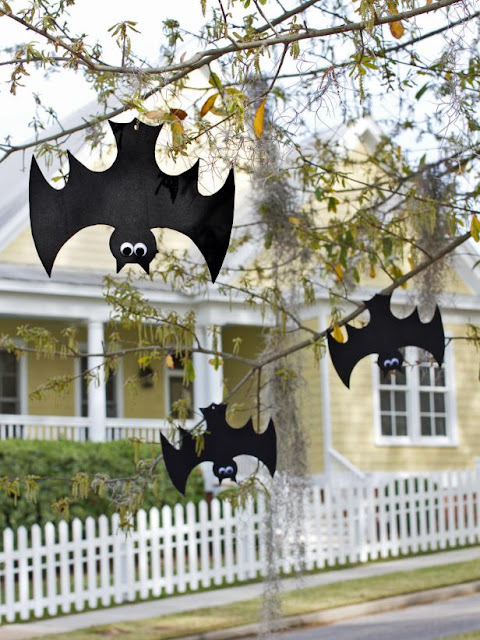 10 CHEAP & Easy Halloween DIYs to Try! It's almost October and I'm JUST NOW starting to think about Halloween. I do this with every holiday, though. 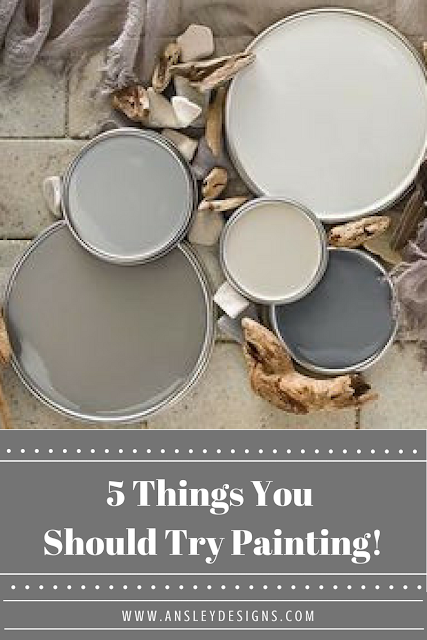 As a blogger I should be doing these projects and decorating well in advance; alas, I'm a horrible planner! 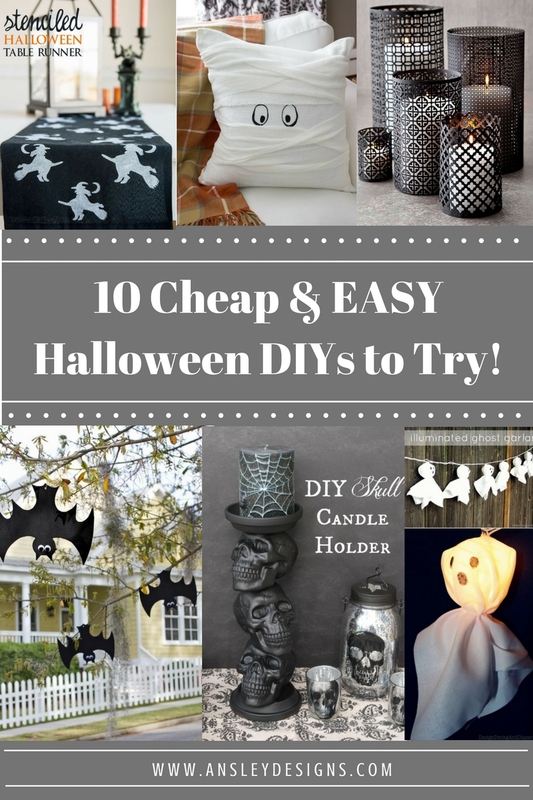 So, here's a round up of some easy and quick Halloween projects to jump start your season! This project is by yours truly. ;) My favorite part? Each double window only cost me $1.20 to make! All of the silhouettes I was able to create in just one evening!!! Easy and cheap, two of my major requirements for projects! See the full post and tutorial here! Also, here's another version with more window templates! I love the simplicity of this project by the Polka Dot Chair! 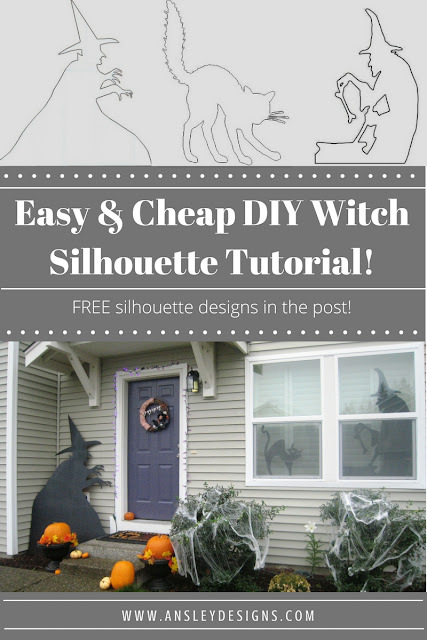 You can cut out your own stencil with a silhouette machine or cricket...or if you have neither, then just print the image and use a xacto knife. I have done many projects that way! 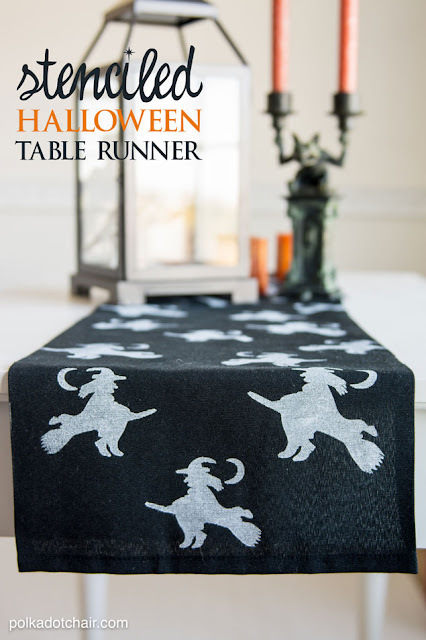 Here's a cheap black runner I found on Amazon for only $5.50! I think this project would look so pretty on this shimmery silk runner! These DIY candle holders are beautiful! I bet they cast the most amazing glow! 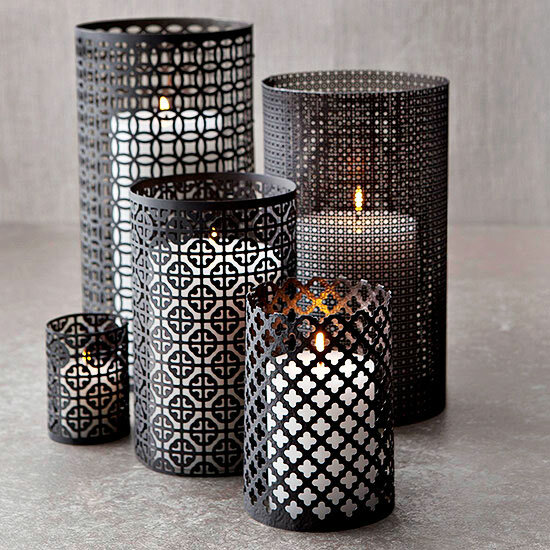 A cheaper version could be to just buy some pretty cut cardstock and wrap it around any existing clear candleholders you own! These could totally work as year round decor! For Christmas just paint them a different color or leave them black and attach one of those cheap tiny red bows! I think this definitely just got added to my "to make" list. I really like that these will stand up to the elements! They look awesome hanging from a tree, but they'd also be perfect underneath the front porch or the eaves of your home! Hang them from your balcony if you're apartment living! 3 cheers for anther fast, easy, and cheap project! Add some creepy ambiance with this simple ghost garland! I think it'd look amazing draped over the top of your door as you hand out Halloween candy! Here's another version using a regular string of lights and ping pong balls! Make a big impact with this huge spider for only a few bucks!!! So simple to make! I love that he'd stand up to some moisture outside! I did a version of this myself several years ago, but that was before I had a nice camera and decent looking photos! ;) Marvelous Mommy did an awesome job with hers! 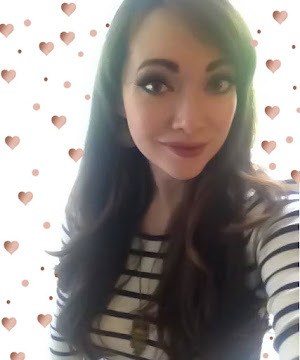 She used her silhouette machine to cut hers out (which I think is what I'll do if I make them again! ), and my version is hand cutting the cardstock. They're both super cute and easy! 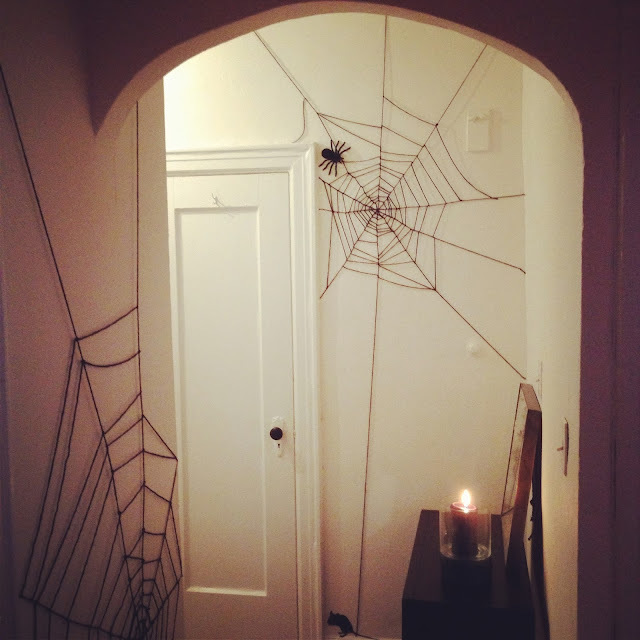 Make your own crawly spider webs for the cost of some yarn! If you're like me...you already have some on hand...so this project would be FREE! I can't wait to make this soon! This skull candleholder is a perfect project for the dollar store! 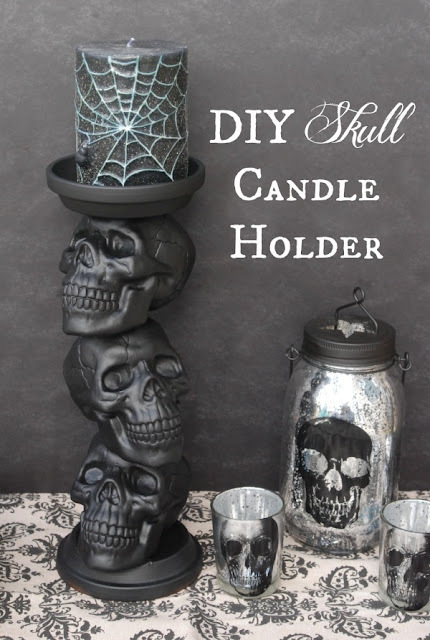 They always have skulls, so you could make this for about $4!! L O V E ! I love pillows. Like really love them! 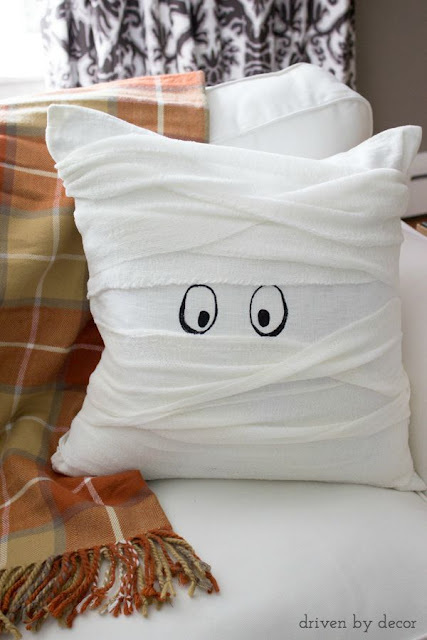 This mummy pillow would look great using cheesecloth, too! So cute! These projects are all seriously so awesome! I have a feeling my Halloween will be a bit overboard this year! I'm considering making them ALL!!!!!!!!! Happy Halloween! I'm always pinning awesome stuff on Pinterest! Be sure to follow my Halloween board!